WP Floating Menu Pro is a smart WordPress plugin that allows you to enhance your WordPress website’s usability with easy one page navigator and many other sticky navigation menus. Use this plugin to add one page scrolling navigation to any WordPress themes / website. Just define the sections on your website and create an one page navigation menu with them in just minutes. Have really useful and smart looking one page navigation bar on your website! Create unlimited navigation menus! Not just one page navigation, create multi page and/or navigation with external URLs / links too. Select from 10 beautiful pre-designed templates or custom design your menu. Different menu for responsive screens. Now you can set different menu for responsive screens and desktop screen separately. Updgraded with various minor features for better UX. Refinements in previous templates for better UI. 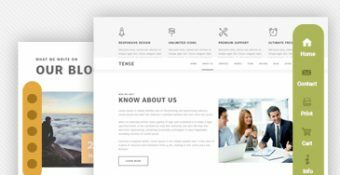 – 13 Templates(excluding the new and beautiful 7 templates) different beautifully designed menu / navigation templates to choose from. – You can add unlimited number of menus / navigation bars in your site. There is no limit in the number of menus you can use in your site. – You can define each individual menu to display in particular page, just select a menu / navigation bar for your page or leave one work for all. – You can enable/disable the menu for mobile version with screen resolution less than 480px. If you couldn’t find the icon listed in the default menu icon gallery, you can also set the custom menu icon in custom menu icon field while generating the menu. You can input either dashicons, font-awesome icons or genericons icon value here. For e.g. For dashicon, you can set icon value as “dashicons dashicons-admin-site”, if fontawesome, you can set “fa fa-bars” along with vesper icon (supportable since version 1.0.9) can be set as “vs vs-ninja”. Or you can also set image icon. You can simply set the svg image or any other image url or upload it in your media gallery and set image as icon. -You can sort the order as easy as 1, 2, 3 in the plugin while creating menu to custom order the menu items. -You can use inline or in page navigation and create one page effect in any of the page or site. Just simply add custom link while generating menu. Hey Buddy!, I found this information for you: "One Page navigator, sticky menu for WordPress – WP Floating Menu Pro". Here is the website link: https://access-keys.com/wordpress-plugins/wp-floating-menu-pro/. Thank you.